We were out again shooting at structures. This time is was an Athanor belonging to Pandemic Horde over in The Kalevala Expanse in LEM-I1. Liberty Squad mounted up and followed Cainun off into PH space where we found the structure waiting for us. The Athanor had been reinforced already and we were there for the armor timer. The first run, the initial reinforcement, doesn’t mean much, save for setting a date for the next two possible events. 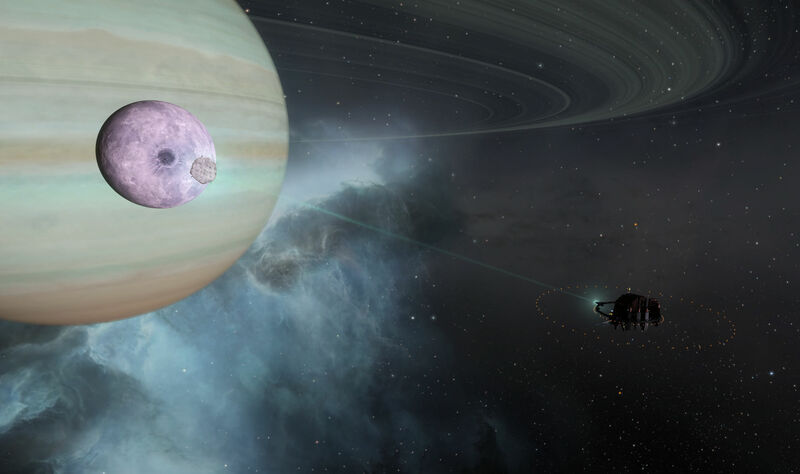 The interesting thing about this particular Athanor was that it was in the midst of breaking off a chunk of the nearby moon as part of its mining cycle. This is called a frack, since the station is fracturing off a chunk of the moon. It is one of those things that looks pretty neat out in space. It is actually a bit of a trick to get the camera to get all of that lined up because the size and scale of the different parts are so different. The Athanor is tiny, visible only due to its proximity, and jumps around quite a bit as you move the camera. The moon and the planet are both huge and distant and barely move at all unless you pan the camera aggressively, which sends the Athanor flying off screen. And then there is the chunk of moon itself, which is close than you might think. EVE Online does a pretty good job of delivering on size and perspective. Would, except that we were there for the armor timer and PH was not. 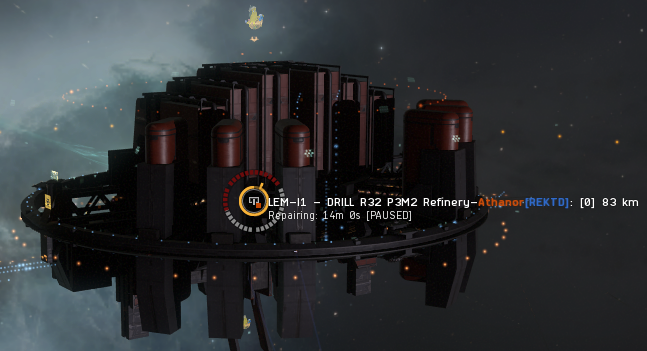 Not much happens when you first hit an Upwell structure. But when you win the armor timer and set things up for the final match, certain operational restrictions start to apply. You cannot remove modules or reconfigure the structure. And, if it is a moon mining platform mid-frack, you lose the moon chunk. So when we finished our shoot and the next timer came up, the moon chunk was gone. I’m not sure where the chunk goes. It is just no longer there as the mining cycle was turned off. 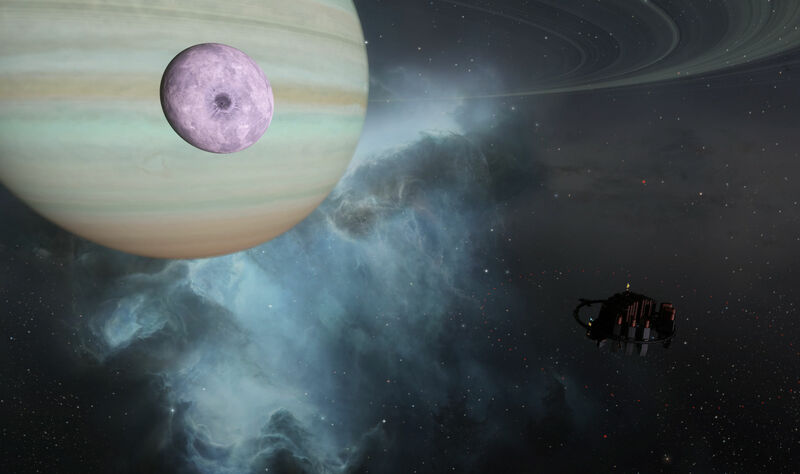 It would be nice if CCP left the chunk there for a bit, showing it drifting off to become a small satellite or have it crash back into the moon. But that is probably a bit too much to ask. We weren’t going to stick around long enough to watch that sort of thing. Off we went once the next timer was set, knowing that there was one moon that wouldn’t be mined soon. This entry was posted in entertainment, EVE Online, Null Sec and tagged Athanor, Cainun, LEM-I1, Liberty Squad, Pandemic Horde, The Kalevala Expanse on January 14, 2019 by Wilhelm Arcturus.